At So Cal Stock’s mechanical day in January 2016, Keith Collins showed me his classic WGP Minicocker that he purchased back around 1992-93. 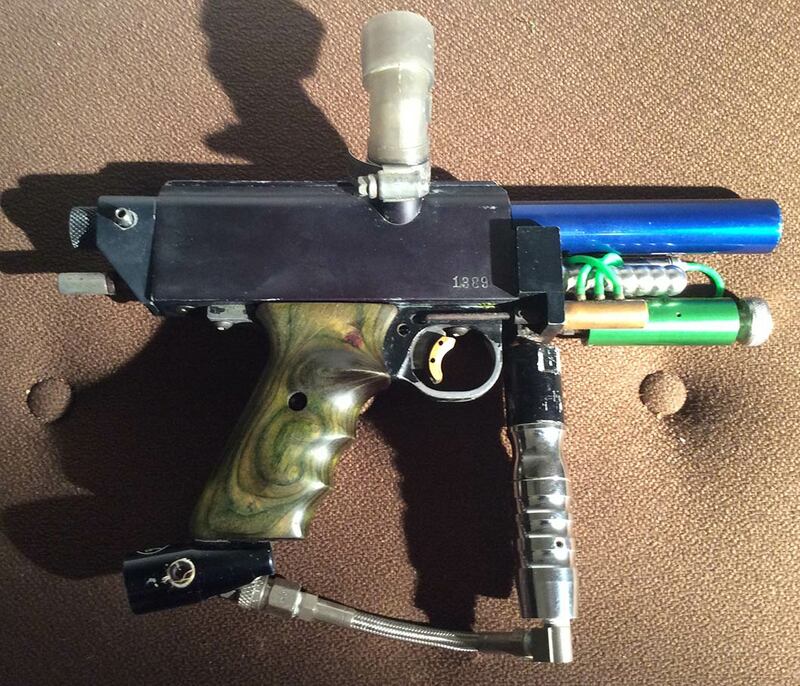 Keith started playing around in the late 1980s, with a PMI Piranha as his first paintgun. He later purchased a Line SI Bushmaster around 1990. In 1991 Keith purchased his first semi automatic, a blue Autococker, and then moved to a Line SI Promaster in 1992. In 1993 he purchased his Minicocker pictured as well as a Grey Anodized B&M Sniper 3. In 1994 he bought a Minimag and traded his Piranha for a Sniper 2. 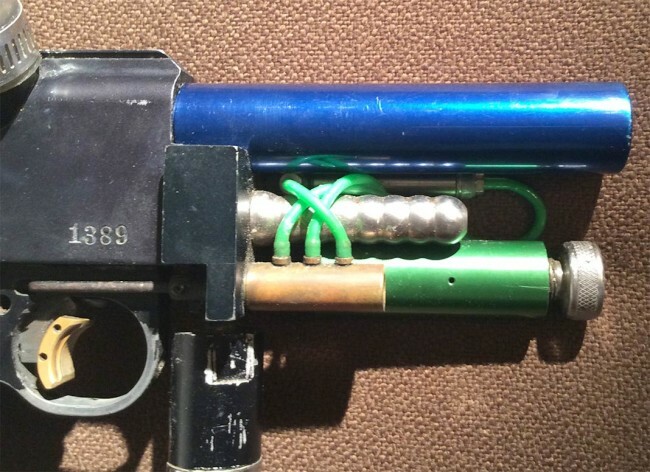 This Mini is serial 1389 and instead of the standard green shorty WGP Minicocker barrel it came with a bright blue barrel. 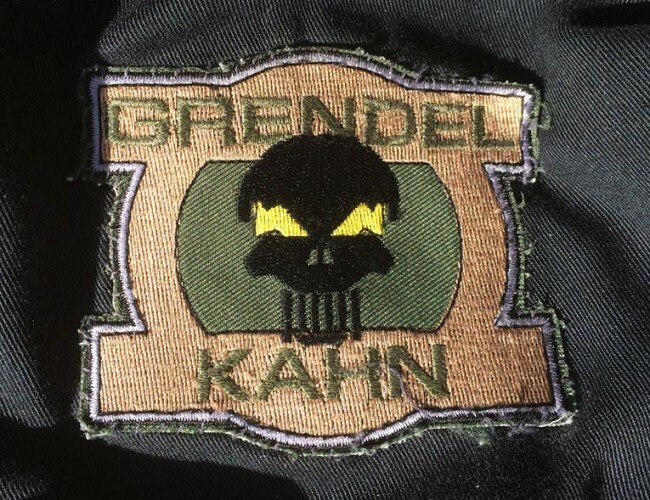 Keith Collin’s Grendel Kahn Patch off his Tiger Stripe pullover. During the late 1980s and 1990s, Keith frequented many of the Southern California fields. His home field for several of the early teams he played on was Fields of Honor. 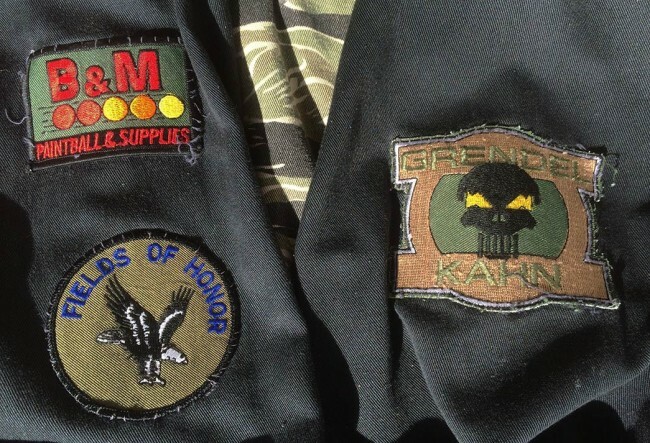 The sleeve’s on Keith’s Tiger Stripe pullovers with his team patch for Grendel Kahn, Fields of Honor, and B and M.
“The first [team I played on] was Grendel Kahn, we used to play up at Fields of Honor. Played againsts a lot of the Mafia guys, which, later on, we’d form [the Bushmaster with]. [I] played with them a bit, up through , then did some Team of Honor work. Small Bushwacker’s stint for like a month, but there were other things to do. Keith played in the Wasaga Beach Paintball Adventure “Beach Blitz” Event in 1994 with the Bushmaster, which took place in Wasaga Beach, Canada. He sent me photos of this event a few years back. At this event the Bushmasters won Montneel Z-1s. Keith remember the last year of Team of Honor as 1998. Serial 1389 and stock Blue Minicocker barrel. In 1999 Keith joined with Sonny “Fearless Leader” Phommarine and several of the other guys who now play with the Southern California Stock Group, to form Broken Arrow. Find Keith playing with Southern California Stock Group.